Any hikers out there? The Western Cape certainly has an incredible range of mountains and hikes for the outdoor enthusiast. It's hardly worth mentioning Cape Town's iconic Table Mountain; the back drop to one of the world's most beautiful cities. Other very popular climbing spots in and around the city include Lion's Head, Signal Hill and Devil's Peak. But there are so many more walks and hikes in and around the city that I can't mention in this short post. For more, here's an extensive online list at Cape Town Magazine. "The stretch between Bakoven and Oudekraal is dominated by a series of mountains known as the Twelve Apostles, after Jesus' disciples, which is a bit of an anomaly because there are actually seventeen or eighteen buttresses, depending how you count them, not twelve (not that anyone is counting, given the scenery). When the Cape was under the Dutch (before 1795) this group of mountains was known as Kasteelbergen or Castle Mountains and Gewelbergen (Gable Mountains). Together they form a scenic stretch of mountain. Although not as high as the Table, they are arguably more impressive, their crags, ravines, gullies and ridges an invitation to explore. Which is why some of the best hiking in Cape Town combs happens here." Whether you're looking to ascend these ancient towers, or content to admire them over a glass of wine, the Cape certainly offers beauty in abundance. I sometimes joke with visitors to the Gables, that we offer a Cape experience "minus the mountains"! Joburg, though hilly seems very flat against Cape Town's mountaneous backdrop. Although not able to compete with the height and breadth of Western Cape ranges, not far from Joburg is one of the oldest mountain ranges in the world - The Magaliesberg. Situated between the grassland highveld and the bushveld savannah, it boasts amazing bird and plant life, craggy kloofs and rich geological and paleantological sites and rich deposits. I enjoyed a relaxing weekend out of the city with some friends recently to the family farm 'Kloofwaters'; bought by my grandparents in the 70s. Special place. No one can visit the Western Cape without a visit to one of the many magnificent wine estates! South Africa's wine making history originates from the 17th century with the Dutch and later, French Hugenot settlements, who brought their know-how to the Cape. With a Mediterranean climate (wet winters, dry summers), clay soils, undulating hills and occasional cool sea breezes provided just the right conditions for the first vintners. Groot Constantia Manor House at sunset. But a trip out of Cape Town is a must! Franschhoek, Stellenbosch, Somerset West, Paarl and Robertson offer a feast for the senses - set amongst mountaneous backdrops, with dozens of estates offering not only world renowned wine but fine dining and events throughout the year. For more information, visit Franschhoek or Stellenbosch Tourism. We had fun hosting our first Bubbly Masterclass event earlier this month in partnership with Corlien Morris of Wine Menu in Illovo. After Christa Von la Chevallerie took participants through nine different bubblies, there were merry vibes here at The Gables! Look forward to hosting more wine events here. The Gables is often approached about weddings, but for now we're keeping our various events small and intimate. HOWEVER we absolutely welcome photography shoots! 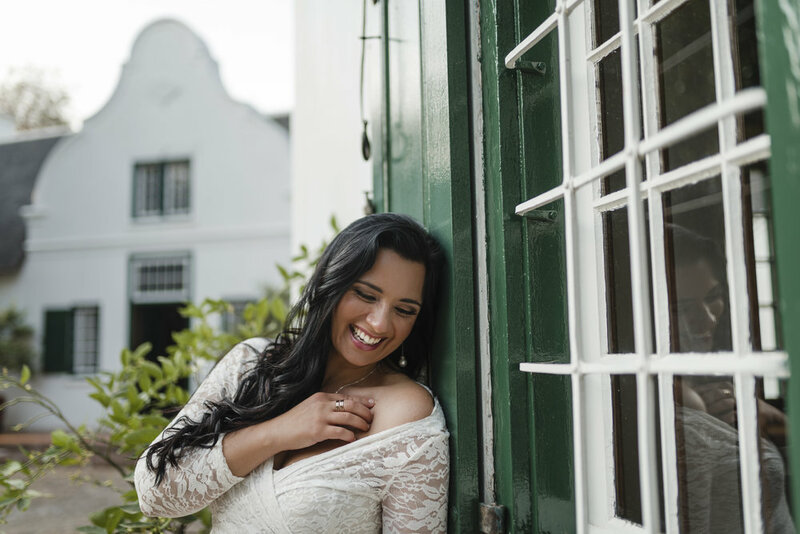 We recently partnered with Wynand van der Merwe, who specialises in wedding and lifestyle shoots and he took some special shots. Visit his website to see more of his work or visit the Admired in Africa awards for some of his highlights. Contact us for rates and photography packages. "Looking for a little Cape country tranquility nestled in the heart of bustling Sandton? 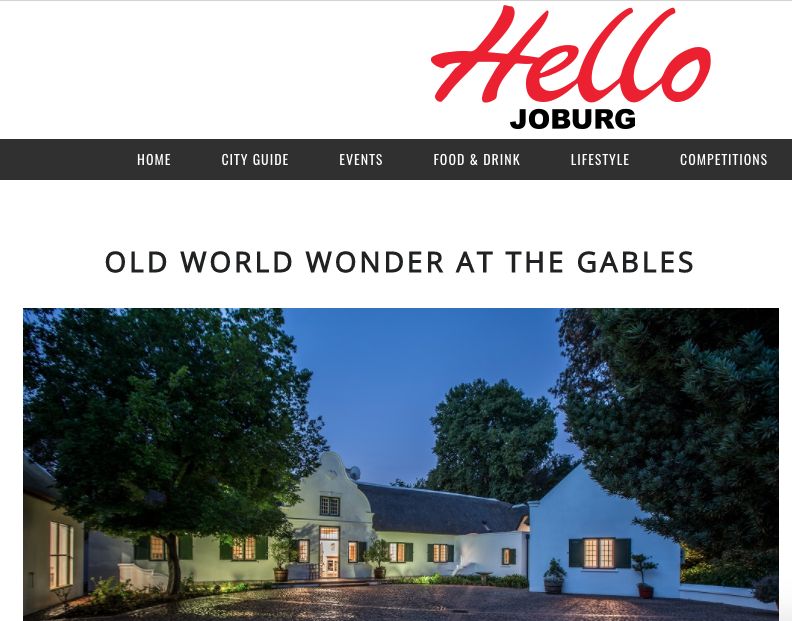 Hello Joburgers, we’ve found it in the form of the gorgeous new venue, The Gables in Sandhurst, and you won’t be disappointed. The Gables has changed the game. Forget sleek metal and the sound of traffic – this venue is taking you back to a 17th century Western Cape homestead. Get your business done in the lap of old-world luxury, where peace and quiet reign." Thanks to Hello Joburg for the feature a few months back! They've summed up the experience we like to give our guests rather nicely. In the next few posts, I'll be honing in on what makes the Cape, Cape (! ), and how we provide a pretty authentic experience without having to hop on a plane to The Mother City! Please call us to make an appointment, Monday - Saturday. We look forward to hearing from you! Be the first to hear about our news & events.